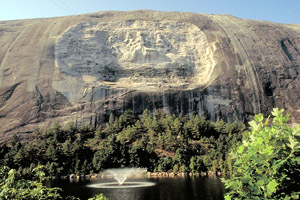 Fun-seeking student groups on Peach State excursion won’t want to miss a visit to Stone Mountain Park in sunny Atlanta, Georgia. Sprawled on 3,200 naturally beautiful acres, the popular attraction features a wide variety of fantastic family-style activities and historic points of interest in addition to hosting scores of annual events such as Spring Fun Break, Summer at the Rock, the Yellow Daisy Festival, the Pumpkin Festival, the Indian Festival and Pow Wow, and Stone Mountain Christmas. The elevation at the mountain’s summit is 1,686 feet; once at the top, accessible by walk-up trail on the west side or by the Skyride aerial tram, happy wanderers will find a dramatically stark landscape of bare rock and rock pools teeming with interesting freshwater life and commanding views of the surrounding area including the skyline of downtown Atlanta, and, on very clear days, the ancient Appalachian Mountains. Stone Mountain’s lower slopes are wooded; the rare Georgia oak was first discovered at its summit, and several fine specimens can easily be spotted along the trail and in the woods around its base; in the Fall, the (also rare!) Confederate Yellow Daisy appears, sprouting up from rock crevices. Cool off with a “splash and dash” through Geyser Towers, hit any one of a variety of excellent hiking trails, trek through the lush treetops on the SkyHike rope adventure course or cruise Skyride to the summit to get a closer look at the Confederate Memorial Carving. Hop a train around the mountain, tour the Antebellum Plantation and Farmyard open air museum, and visit the historic Grist Mill and Quarry Exhibit. On balmy summer evenings, visitors are treated to the Stone Mountain Laser Show Spectacular, a must-see Atlanta tradition of state-of the-art digital graphics and awe-inspiring laser show effects, closing with a stunning fireworks finale; afterward, tuck into your cozy tent and sleep beneath the stars in Georgia’s largest campground, or relax in the comfort of nineteenth century plantation resort ambiance!